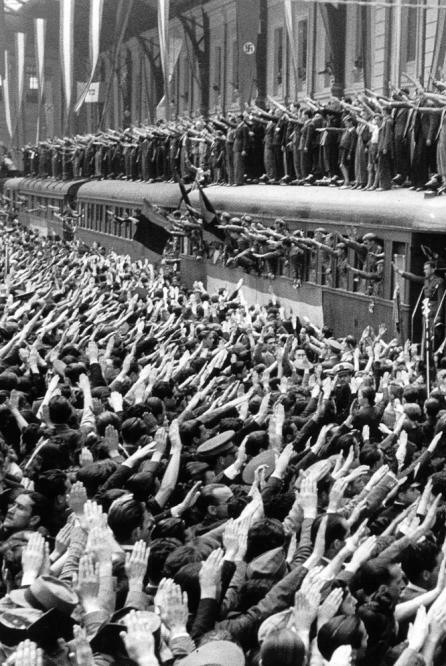 Farewell to the volunteers of the Blue Division, Estación del Norte, Madrid, 1941. 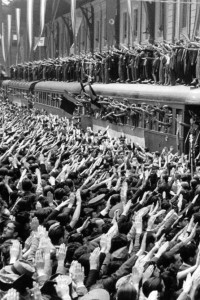 According to today’s literary supplement of El País (Babelia), Jorge M. Reverte has published a new book in which he reconstructs the history of an important part of Francoist Spain’s support of Hitler and Nazism during World War II. The Spanish falangist José Luis Arrese proposed the name “División Azul” to refer to the almost 50,000 Spanish troops who, between 1941 and 1944, swore allegiance to the Führer and fought on the Eastern Front, in an attempt to “wipe Russia off the face of the map.” But the precise name of the unit was the 250th Division of the Wehrmacht, and its charge, according to the author, was to help Hitler destroy a common enemy: Jews, Bolsheviks and masons. Using oral histories, as well as published and unpublished memoirs (the author’s father formed part of the Blue Division), Martínez Reverte’s book tries to reconstruct the texture of the decisions and experiences of the individuals who took part in this episode of Spanish support of the Axis. Approximately 5,000 members of the 250th Division died in battle on Russian soil. More here. Read the book’s first pages here (pdf).